This section is a compilation of general spiritual questions asked by devotees. 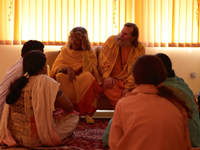 Of particular interest is the discussion with Swamiji on relationships, especially on marriage and finding the right partner. Please bookmark this page, as you will find yourself visiting this page often to "consult" Swamiji. If you have a question that is not covered, then you can ask it on our yahoo chat forum. Increase Sadhana, Decrease Worldly Attachment!